Were someone listening to this album for the first time with it merely providing background whilst doing something else, the first thought would probably be ‘what a nice sounding, pleasantly mellow album. Big mistake! 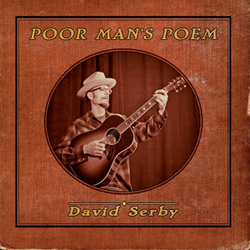 The album opens with ‘nice’ sounding mandolin and banjo then in comes Serby’s pleasant, almost crooner like vocals, but as the album progresses you start to realise that this album has a lot more than ‘pleasant’ sounds! The stories are incredibly dark, heartrending tales of murder, revenge, battle disfigurement, all incredibly descriptive and so evocative you can almost feel yourself to be in some of these tales of the downtrodden, many of which are, despite being set in the past, highly relevant today. All ten songs on this lyrically evocative album are written by Serby with each and every tale having an epic cinematic quality. An almost unique achievement, in fact I can’t think of any other album that can match this feat! The instrumentation is always excellent, never failing to allow his vocals to express the story and always giving the right amount of colour, and include as well as Serby’s own acoustic guitar, mandolin, accordion, dobro, banjo, fiddle, harmonium and pan pipes! A real melange of roots instruments and yet none are over used, in fact the album at times has an almost sparse feel. The musicianship is of the highest quality but the strength of this album, and it is a huge strength, is in Serby’s ability to write and put across some quite brilliantly epic tales. It is almost impossible to pick out specific highlights because every song has a riveting tale to tell. They are all stories in which the heroes all possess incredibly high morals but have been beaten down by the sytem to such a degree that they have to fight back against over whelming odds with little or no chance of success. Watch over her baby is a harrowing tale of a fourteen year old girl cast out by her family for getting pregnant and about her only chance to find the child a good home. This is followed by Wild West Show which includes some nice harmonica playing plus excellent banjo on a story that tells of a native Americans fight against the degradation of a ‘Wild west show,’ whilst Lay Down My Colt sounds beautiful musically, but actually tells of the horrors unleashed by the lust for vengeance. The style of the songs has much in common with Tom Russell or Dave Alvin of recent times and you can be pretty sure that had either of these two huge talents been responsible for this album they would probably be as proud of it as anything they have ever done, maybe even seeing it as a career highlight! I still can’t quite take to his voice, although this will be what attracts many, with his almost mainstream sounding tones! Of course the mainstream won’t be able to cope with these incredibly epic songs that have to be listened to rather than just blithely putting the c.d on as background music! I must confess that although this is his fourth album I had never heard of him before, but will now be investigating his previous three recordings. If they are half as good as this one they will be well worth listening to! A tremendous album by a hugely talented singer songwriter.